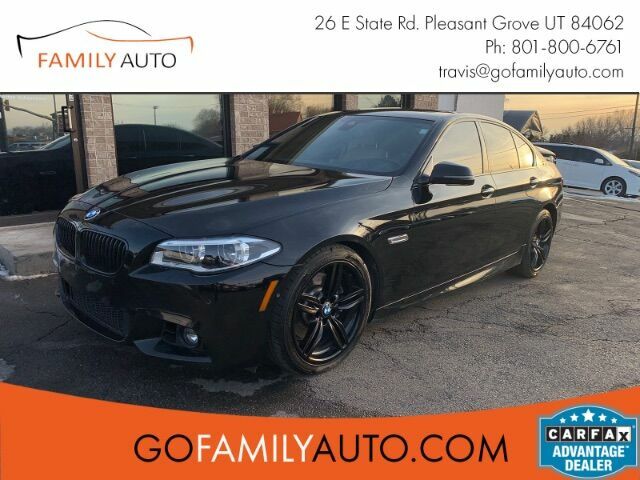 CarFax CERTIFIED Clean Title on this STUNNING 2015 BMW 535i M-Sport. This black 535i is ready to catch eyes wherever you go, nearly brand new tires, loaded with M-Sport, Driver Assist, and Comfort Access Package, Heads Up Display, Navigation, Birds Eye View Cameras, Lane Departure Warning, Leather, Heated Seats, Back Up Camera, Push Button Start, Sunroof, Power Trunk, Rain sensing wipers and SO MUCH MORE! This non-smoker 535i has passed all inspections and is ready for immediate delivery. www.GoFamilyAuto.com 801-800-6761. We are affiliated with most lenders and have rates as low as 3.99% OAC. Extended warranties are available. Family Auto strives to provide accurate vehicle information, from time to time we may miss a feature or include one erroneously. Please don''t hesitate to confirm a specific feature.